Russian sage, also referred to as perovskia atriplicifolia, is a deciduous perennial. It has long stems dotted with small purple flowers and is sometimes used in cut flower arrangements. Its fragrant flowers attract bees and butterflies. It is used in herbal medicine to soothe the stomach, treat fevers and help relieve cold or flu symptoms. Talk with your doctor before using Russian sage for medicinal reasons. Sage steeped for 15 to 30 minutes in a covered cup of hot water makes a medicinal tea that can be used to help relieve stomach upset and indigestion, according to Botanical.com. Russian sage is said to arrest diarrhea and soothe the stomach. You can drink the tea cold or hot. Russian sage is used to help reduce fevers. The steeped tea is left to cool. A cloth is soaked in the tea and used as a compress on the forehead to help reduce the fever. The aromatic scent of the sage also helps by having a soothing effect. 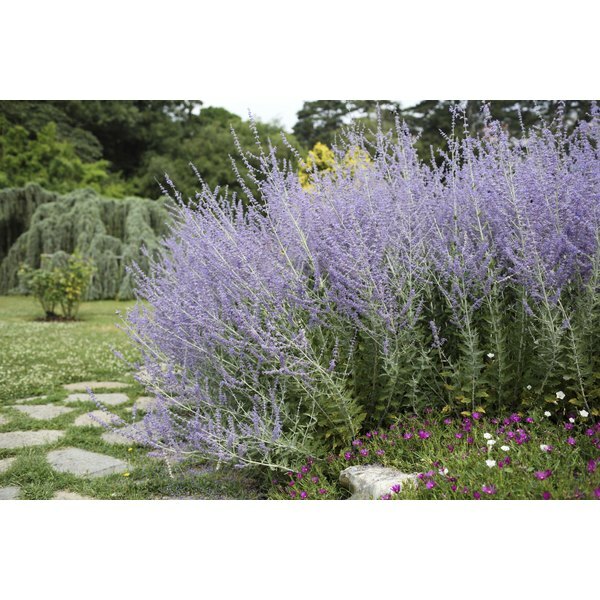 Because Russian sage is aromatic, it helps open blocked airways and has a calming effect. This is one of the reasons it is used to help relieve cold and flu symptoms. It has expectorate properties that ease bronchial afflictions. A pot of boiled water filled with Russian sage leaves can be used similar to a steam pot. Place a towel over your head and lean over the pot Russian sage infused water. The sage steam will help clear blocked nasal passageways. As with any hot tea, Russian sage tea when drunk warm, helps the body to perspire. The calming tea can help sooth nausea associated with colds and flues. The Chumash Indians of the Pacific Southwest traditionally used sage for healing and palliative care. Practitioners of alternative medicine in other cultures, such as Chinese herbalists, have used Russian sage for a variety of ailments. As of 2010, there are very few clinical studies on sage as an alternative treatment for pain or illness. Before taking any herbal supplement, consult with your doctor or health care professional.